The Lady Grace necklace features a large translucent milky pear drop moonstone with gorgeous blue flashes. 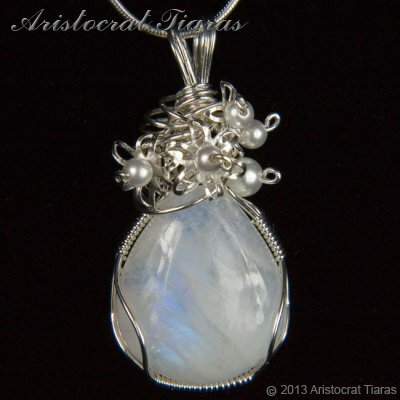 This gemstone is set in a handmade unique silver wire framework incorporating silver flowers and Swarovski pearls. This elegant necklace from Aristocrat Tiaras is part of our moonstone jewellery collection for one special mother of the bride or lady to enhance her outfit or makes a great gift for any special occasion! Please note: The moonstone is one off gemstone and the necklace shown is the actual item for sale and the gemstone can not be duplicated. All our jewellery is handmade in Herefordshire UK. Due to monitor display, colour may vary slightly from the picture. Ready to ship! This necklace could be with you by 1pm Saturday 20th April (tomorrow). Please contact us if you would like to know more about this item. Reddit Stumble Upon Twitter Yahoo!